Grade A. Value pack. Labels for Education. Not labeled for individual sale. Contains no juice. Only the good stuff. No high fructose corn syrup. No artificial colors or flavors. 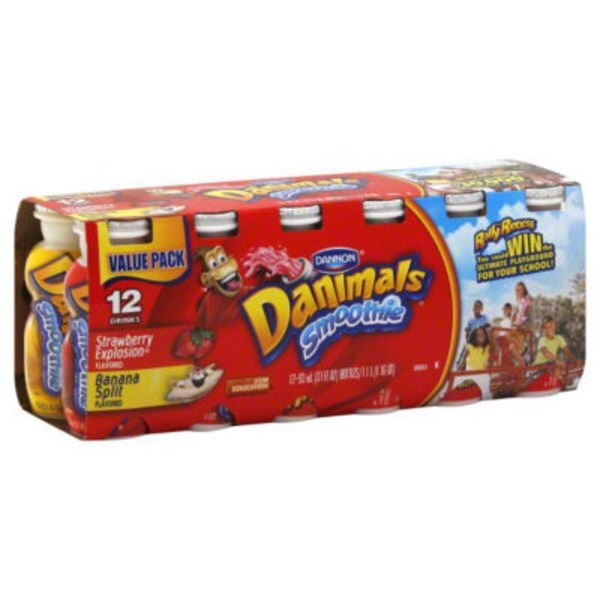 Good source of calcium and vitamin D. Strawberry explosion contains no juice (Danimals strawberry explosion drink has no juice added for flavor, but does contain vegetable juice added for color). Banana split contains no juice. Contains active yogurt cultures. A product of the Danone Group. Grab! Shake! Drink! Strawberry Explosion Flavor: (Cultured Grade A Low Fat Milk, Cane Sugar, Water, Contains Less than 1% of Corn Starch, Modified Food Starch, Milk Minerals, Natural Flavors, Fruit and Vegetable Juice (for Color), Lemon Juice Concentrate, Vitamin D3).Banana Split Flavor: (Cultured Grade A Low Fat Milk, Cane Sugar, Water, Contains Less than 1% of Corn Starch, Modified Food Starch, Natural Flavors, Milk Minerals, Lemon Juice Concentrate, Fruit Juice (for Color), Vitamin D3). Shake before using. Keep refrigerated.